Ray's return: Darlington, managed by Ray Hankin, claimed a 1-1 draw at London Road in 1991 with a goal from Nick Cusack. Lee Tomlin has caught Ray Hankin up as the Posh player with the most red cards to his name. Read Alan Swann on Lee Tomlin: A flawed and foolish genius. Both can now ‘boast’ of five dismissals apiece, although Hankin managed his in just 18 months before he was sacked by Posh manager John Wile. In fact Hankin started just 36 times in total for Posh so was collecting on average a red card for every seven appearances. Hankin and Tomlin had plenty in common apart from their failure to finish matches on a regular basis. Hankin was also a terrific player. He’d already played for Burnley, Leeds and Middlesbrough before Wile brought him to London Road soon after the start of the 198-3-84 season. Hankin was a powerfully built striker, but he also had great technical skills. But Hankin was sent off four times in that first season at Posh as his robust challenges regularly irritated referees. He missed the start of the following season because of injury and within weeks of his return he was sent off again at home to Port Vale, causing Wile to rip up his contract. Hankin joined Wolves briefly before retiring from professional football at the age of 29. He then worked as a Football in the Community Officer at Newcastle United. Sagi Burton is next on the list of Posh bad boys with four red cards. Ken Charlery, Dean Hooper, Andy Edwards and Paul Carden have all seen red on three occasions. 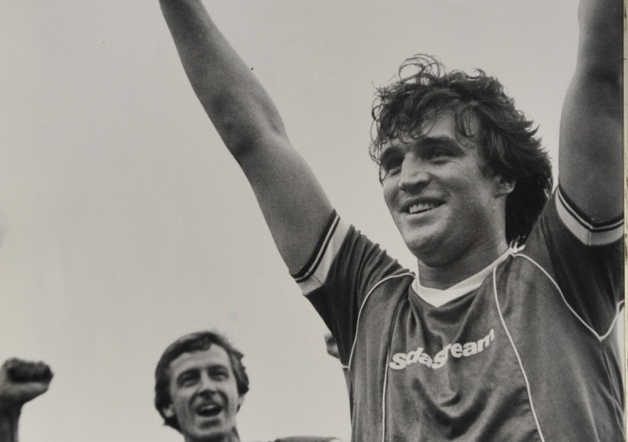 I have just read your on-line article as regards to Ray Hankin and am quite surprised and happy that you have now given him the respect that his football career truly deserved! I wrote to you some time ago after I read your article which compared Ray's disciplinary record to Kevin Davies' and on that basis you sarcastically felt that Ray should also have been considered for England! I am always searching for additional information and have added your piece to a part of my page, but am now quite at peace to realise that you also recognise the appeal that Ray Hankin has, as you fully understand that Ray was always unpredictable and could turn from hero into a villain when completely unexpected and vise versa! Hence, the reason why John Wile made Ray club captain in no time at all! Posh players responsible for tackles that could be determined as X-rated include Billy Manuel, Archie Styles, Ray Hankin, Gregor Rioch and John McGlashan (ask Micky Hazard). 84/85: BR, Phil Chard, Errington Kelly, Kenny Beech, Brian Klug, Martin Pike, Trevor Quow. CR: Jimmy Holmes, assistant manager, Alan Waddle, Neil Firm, David Seaman, Ray Hankin, Trevor Slack, Bill Harvey, Physio. FR: Garry Worrall, Patrick Rayment, John Wile, manager, Francis cassidy, David Johnson. Ray played 33 league and League Cup games games for "The Posh" scoring 9 goals but was sent off in 5 of these games. He made an in instant impact, scoring twice on his debut against Torquay on the10th of September 1983, in a 5-0 win! He joined an elite band of posh new boys to score twice on their debut as the only other player to achieve this feat was Alan Guy, against Swansea at London Road in March 1979.Four days later they had to face Crystal Palace in the league Cup, the team who had outclassed them in their first game 3-0! Pete lane, Peterborough United historian: For a big man Ray possessed such delicate skills on the ball, his trickery a delight to watch and his powerful heading of the ball was second to none. Quickly he became a firm favourite with the Posh fans, but his temper unfortunately got the better of him, hence 5 red cards within 18 months. Although I must say I felt a little sorry for him on odd occasions when he was a marked man by some referees. I am sorry to say he will not be a candidate in my Posh Hall of Fame only due to that very poor disciplinary record, but nevertheless I appreciate your own views. I hope you will find this information useful. Thanks, Peter lane, Peterborough historian. RAY HANKIN made his debut for Posh at home to Torquay result 5-0 - Ray scored twice. Posh v Mansfield [score 3-0] 24.09.83. Chris lakey: I remember many years ago Peterborough United signed Ray Hankin, who had come through the Burnley youth system and moved to Leeds. A lot was expected, but he was a disciplinary nightmare. He was brilliant for Posh, but seemed to spend as much time suspended as available. Shame, he was a good player and the fans loved him. One of his dismissals came in a game in September 1983 against Mansfield after an almighty tussle with George Foster. Both men were eventually sent off at the same time. They were bewildered and chatted as they made their way to the tunnel, shaking hands and acknowledging the applause of the crowd, who had seen a brilliant, physical battle between two real men. Hankin played 33 league and League Cup games for the Posh. He scored nine goals – but was sent off five times and finally sacked because of it. Men like Hankin and Duncan Ferguson are drifting out of the game because they simply wouldn’t last. One tough challenge and a canny opponent would have them red-carded without a second thought. There isn’t a place for them in modern day football. Maybe that’s a good thing. But I miss them. Posh v Stoke [score 1-2] 26.10.83 booked after only 12 seconds! Posh v Port Vale [score 0-0] 2.3.85 - He was then sacked! Above info kindly contributed by Peterborough historian Peter Lane, thanks again. Ray's debut for "The Posh". He scored twice in a 5-0 win! 14/09/1983: Posh had travelled to Selhurst Park for the first leg of the first-round Football League Cup tie a fortnight earlier and were outclassed by the likes of Vince Hilaire, John Fashanu and Jim Cannon as they slipped to a 3-0 defeat. Few gave Posh any hope in the second leg even though big striker Ray Hankin had marked his debut with two goals four days earlier after arriving on a free transfer from Middlesbrough. That pessimism was reflected in a London Road crowd just in excess of 3,500, but few who were there will have forgotten an amazing night of drama. Hankin opened the scoring with a brilliant chip just past the half-hour mark and within 20 minutes the first-leg deficit from Selhurst Park had been wiped out through further goals from Colin Clarke and Trevor Quow. And that s how it stayed for the rest of the game and through 30 minutes of extra-time leading to a penalty shoot-out. Posh: Seaman, Chard, Imlach, Wile, Slack, Beech, Pike, Quow, Buchanan, Hankin, Clarke. Sub: Benjamin. Crystal Palace: Wood, Locke, Gilbert, Brooks, Cannon, Lacy, Giles, Cummins, Fashanu, Murphy, Hilaire. Sub: Nebbeling. Goals: Posh - Hankin (32 mins), Clarke (38), Quow (49). Official: J Hough. Posh were fortunate enough to have David Seaman in their goal, although the Palace goalkeeper was George Wood, a Scottish international. Seaman saved brilliantly from Jerry Murphy and Stan Cummins, while Phil Chard, Kenny Beech and Martin Pike scored from the spot for Posh. Substitute Ian Benjamin then stepped up to take the potentially decisive kick, even though he d been introduced to the game as a substitute just a few seconds before the final whistle, replacing Ray Hankin and hadn't yet touched the ball. But it didn t matter as he sent Wood the wrong way, sparking a mini-pitch invasion by the delighted home fans. "Posh" won 4-2 on penalties. Player-manager John Wile said: "I ve been involved in some great cup-ties in my career, but this is right up there with them.It was a great atmosphere despite the small crowd and the team were absolutely magnificent from start to finish. We looked like the First division side and signing Ray Hankin could be the best bit of business I ve done at the club." Wile wasn t to know that those words would return to haunt him and, although he steered Posh to the fifth round of the FA Cup two seasons later, his management at London Road wasn't a success. 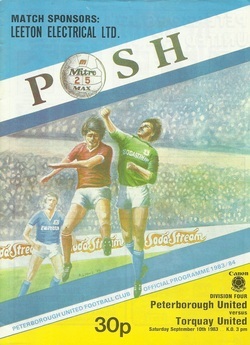 After beating Palace, Posh battled to a superb goalless draw at first division Stoke City, but lost 2-1 at home in the second leg at London Road, a match that saw the dismissal of Hankin. It was the start of things to come. 2-0 to Peterborough with Ray scoring one. 5th October, 1983. The week before this game, Stoke beat league leaders-West Ham! After a well deserved 0-0 draw away to Stoke in the first leg, Fourth Division Peterborough failed to capitalise on their home advantage and were defeated 2-1 by their First Division opponents. Ray was yellow carded after twelve seconds and later received the red card! After a well deserved 0-0 draw away to Stoke in the first leg, Fourth Division Peterborough failed to capitalise on their home advantage and were defeated 2-1 by their First Division opponents. Ray was yellow carded after twelve seconds and later received the red card! Ray battles in the air with Stoke City's David McAughtrie and Paul Dyson. Manager: John Wile and Ray Hankin were team mates at the Vancouver Whitecaps. BR: Ray Hankin, Carl Shearer, John Wile, Pierce O'Leary. MR: David Harvey, Jimmy Holmes, Mark Nickeas, Bob Lenarduzzi, Tino Lettieri. FR: Carl Valentine, Peter Beardsley, Alan Taylor, Buzz Parsons, Peter Lorimer, Assistant Coach, John Giles, Coach, Terry Yorath, Gerry Gray, Dave Norman, Shaun Lowther, Willie Johnston. John Wile, pictured messing about at Highbury against Ipswich in the '78 F.A. Cup Semi, was signed Ray at the Posh. They had both been team-mates a few years earlier at the Whitecaps! 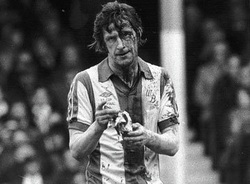 Nik Shanahan: He clashed heads with Brian Talbot who was in the process of scoring a diving header.......Very messy! Ray hits the back of the net, once again! Hartlepool United 0 Peterborough United 3. 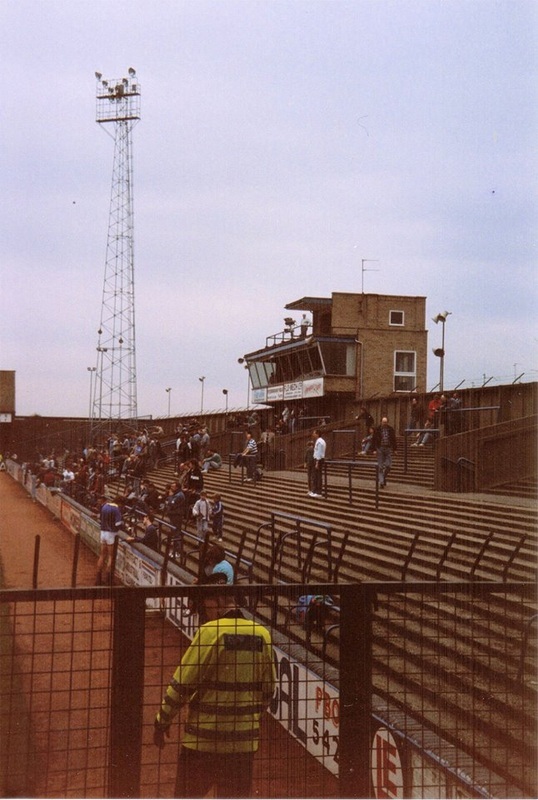 Season1984/85, Date: Saturday, 9th February 1985, Competition Division Four; Opposition Peterborough United; Venue:The Victoria Ground. Score 0-3; Attendance1353; Referee Not known. Two goals by Kelly and one from Ray Hankin. Line ups: HARTLEPOOL UNITED1Eddie Blackburn.2 David Robinson.3 David Linighan.4 Brian Honour.5Tony Smith.6 Phil Brown.7 Kevin Dixon.8 Alan Waddle.9 Paul Dobson.10 Craig Farnaby.11 Mark Taylor.12 Paul Proudlock. PETERBOROUGH UNITED:1 John Turner.2 Everald La Ronde.3 Martin Pike.4 Mick Martin.5 John Wile.6Trevor Slack.7Greig Shepherd.8 Bryan Klug.9 Ray Hankin. 10 Trevor Quow.11 Gary Worrall,12 Errington Kelly. 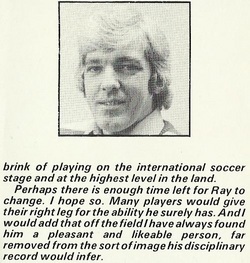 Various Pictures of Ray, Taken From One of My Match Programmes. 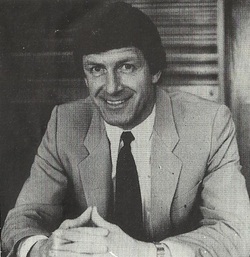 Ray was given the role as club captain. Ray's two goals against Stockport County, Described above; 26th November, 1983; Att: 3,240; Score: 2-0. A day off with the team! Ray marks his return to action at Mansfield; 11th February, 1984; Att: 2,179. The board of director's have decided to terminate the contract of Ray Hankin after his dismissal in the previous match against Port Vale. Obviously, we had problems settling down and re-organising on Saturday when Ray Hankin was sent off so early but we grew in stature as time progressed. The longer play went on, the greater chance there was that we might have snatched a match-winning goal! The Hankin episode is this week's talking point and I have to say that I support 100 percent the decision of the directors. Ray left the referee with little option with his conduct against port Vale and there can be no argument over the course subsequently taken by the official. 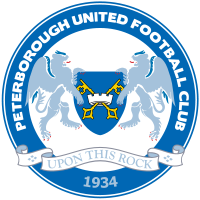 The action of the club in terminating the player's contract is not a happy outcome for either party but we have people on our books who are prepared to wear the colours of Peterborough United with pride and to conduct themselves in a thoroughly professional manner at all times. Ray's past disciplinary record is unfortunate to say the least and this week we arrived at a point where things could not be allowed to continue. I hope it is the sort of situation that never arises again while I am manager and while I understand Ray Hankin might take his case to a tribunal, I am convinced that the club had to take action and that the course we followed was the right one. Action from Ray's final game for "posh".